Not all returns from your customer experience investments are financial. Will that scare your executives? One of the most-frequently-asked questions we hear from companies about listening to customers and, hence, improving the customer experience is: “How can I show ROI for my executives?” It’s a fair question, as improvements often require financial investments, and yet, at the same time, it makes me scratch my head. If the fear is that financial investments to improve the customer experience compete with other budget line items – are those other line items winning business, keeping customers, or driving more revenue? Why don’t executives understand that the purpose of a business is to create a customer – and not just to create a customer but to also do whatever it takes to keep that customer. We need to forget about that 1970s mindset that the purpose of a business is to maximize shareholder value. That’s not a purpose; that’s an outcome of creating customers. Being customer-focused and customer-centric translates to shareholder value. Focus on the customer, on creating customers, and the profits will come. You can build your own business case. Watermark Consulting’s annual research that compares Forrester’s Top 10 Customer Leaders and Bottom 10 Customer Laggards against the S&P 500 for the last seven years. Leaders outperformed the market, with a total return that was 26 points higher than the S&P 500, while Laggards underperformed (by 54 points!) to the point of a negative return! Temkin Group’s annual report on the ROI of Customer Experience states that the customer experience influences likelihood to purchase, recommend, forgive a company for mistakes, and try new offerings right away. Again, there are a lot of metrics out there to support the importance of delivering a great customer experience. Feel free to reach out to me, and I’ll be happy to share those with you. 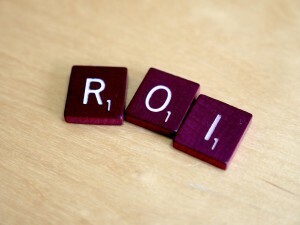 But what about that second approach to showing ROI, building your own business case? This requires some work on your end. When it comes to building your business case, there are a few things to remember. You’ll want to identify your overall program/CX objectives first and then align the business outcomes and benefits tied to each. Clearly, the stronger the business case, the better. Your outcomes may be customer retention, account growth, new business through referrals, culture change, etc. Benefits might include cost savings and other efficiencies. Communicate objectives, outcomes, and benefits to gain buy-in. Building your business case is also about teaching – teaching executives who might not understand the connection between focusing on the customer experience and increasing revenue and profits. One of the ways to do this is to show some quick wins or proofs of concept. Why? Because success breeds success. Everyone wants on that bandwagon. This means there will likely be some skunkworks (unsanctioned projects, of course) – or perhaps bootstrapped efforts – to create those small wins. A lot of our clients start with listening in one area, oftentimes the call center, and showing how listening and using the feedback to fix issues and inefficiencies to improve the experience leads to satisfaction, retention, cost savings, revenue growth, and profitability. One important thing to note is that not all benefits realized or value delivered are financial. At least not immediately – some are emotional (feel good/security) or functional (convenience, choice, speed) benefits. That doesn’t make them any less important because (a) that may be what is most important to your customers and (b) down the road, those emotional and functional benefits can and will translate into financial benefits. Those are, in a nutshell, the economics of a great customer experience. Do your executives need to hear more than that to get started?